So, The Boss and I were Christmas shopping after enjoying steak and a tall cold Boulevard Wheat on tap at the Hereford House, when we came across a display of “Pillow Pets.” Captain Chaos had mentioned that she wanted one for Christmas. A Pillow Pet is a soft, cuddly pillow with a head. There is a Velcro strap that allows the pillow to be folded in half, giving it the appearance of an animal. When opened it is a small pillow. There are thirty-six different Pillow Pets, including dinosaurs, dolphins, whales, bees, unicorns, puppies and a ladybug. The Boss asked me which Pillow Pet I thought the girl would want. Without hesitation, I answered. “A ladybug?” The Boss replied. 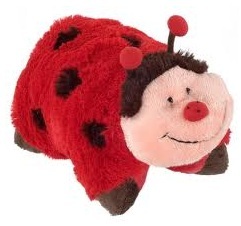 “She wants a LadyBug Pillow Pet,” I told her. We came home with a unicorn. Two days later, Captain Chaos was at a mall with The Aunt, The Boss’s older sister. The Aunt listened carefully as Captain Chaos explained to the mall Santa that she wanted a ladybug Pillow Pet for Christmas, a revelation that brought great consternation to the Boss. “You’re never going to believe this,” The Boss told me when she explained the Captain’s revelation. What I couldn’t believe was how readily The Boss admitted that I was right. Christmas came early. Returning the unicorn Pillow Pet was easy. Finding a ladybug Pillow Pet was not. Persistence paid off, and after a brief full body dive into a huge container of Pillow Pets at our local Wal*mart, The Boss emerged from the bottom of a display box with the last ladybug in the store. Captain Chaos told us at dinner on Christmas Eve that she wanted a ladybug Pillow Pet for Christmas. She asked God for a Ladybug Pillow Pet during her prayers on Christmas Eve. She was thrilled to find one underneath our tree Christmas morning. She even remembered to thank God for her Pillow Pet during prayers last night. But the best part of this tale came yesterday when Captain Chaos walked into our bedroom holding her ladybug to her chest and rubbing her cheek on the soft, fuzzy surface of the pillow. “It’s huggly,” she told us. Aw - that's sweet. My kids wanted the pillow pets, too. We got the ladybug for Blondie and the bumblebee for Red. They opened them - and promptly traded. I never saw a dinosaur one. So how was it that Captain Chaos is afraid of ladybugs but that's what she wanted? The ladybug smile matches the Captain's smile. She definitely is huggly. We have pillow pets at Price Chopper (go figure) that are king size. I'm waiting for T11 to spot them. ahhhh yes, Santa delivered four pillow pets to our house. The unicorn, ladybug, panda, and monkey-TL has determined that he is to old and a boy therefore he doesn't need one! The ladybug matches the Captain's personality-bright and cheerful! Thank goodness none at our house. With missy's allergies stuffies aren't much in demand and still we have billions of them. They have make out in the closets and make babies. I know it. I just have to prove it! Maybe a hidden camera with remove feed. But then I'd go to jail. that was supposed to be 'remote' feed. The Princess tired of me stealing her kitty pillow pet whenever I watched TV, so she campaigned for a pillow pet for Mommy. The kids gave me a panda bear pillow pet for Christmas. I concur with the Captain that it is very, very huggly! For the record (just because us women have to get in the last word...) I didn't think she'd like the ladybug because everytime she sees a ladybug outside she yells "EEEEEWWWWWW! I HATE ladybugs!" And since she so badly wanted a pink room, I figured the pink and purple unicorn would go well. Aww that is too cute! Hunter wants one of those really bad. I totally forgot about it at Christmas! Oops. What a great story! None of our grands have asked for a Pillow Pet and although I've seen them in stores, I just couldn't understand why kids would want one. Now I know - because their huggly! That makes all the difference. Please thank the Captain for clearing it up for me. Hope you have a Happy New Year full of Peace and Laughter! Although the Pillow Pet didn't make it on the any list around here, I know that feeling of fulfilling the wish-- the ONE thing they want. It's a good feeling. I see Cary Grant has returned. Now I'll have to read your blog again with his voice in my head.